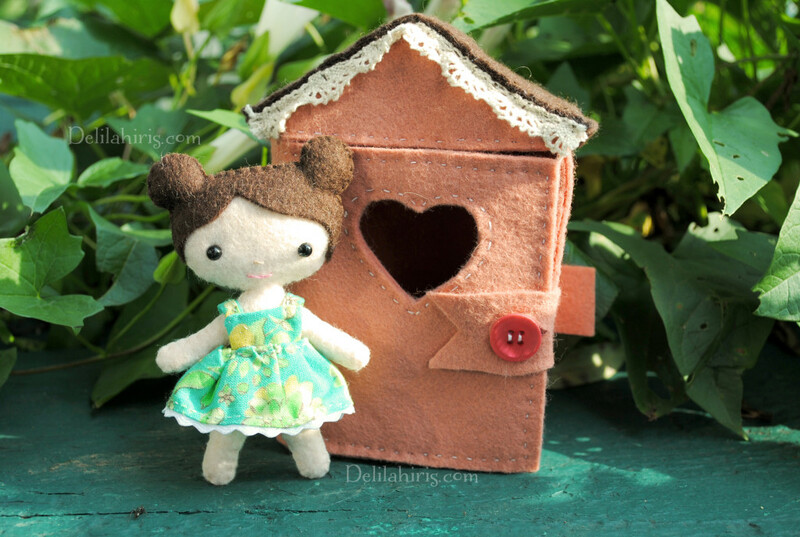 I’ve been interested in felt for a long time, but never tried working with it until very recently, when I found this incredibly adorable tiny felt house pattern from Delilah Iris Designs. It was small enough that I didn’t feel intimidated, and cheap enough that I felt I could afford to make mistakes without feeling too badly about it. While I already had notions such as lace, thread, and buttons, I did purchase several pieces of felt for about two or three dollars. 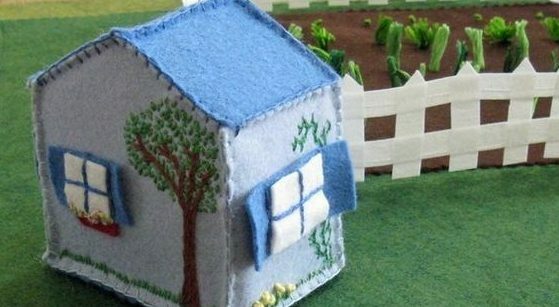 Ten pieces of felt will allow you to make several of these tiny houses, which means this craft is thrifty, and if people like your work, you can sell the houses (as long as you credit the designer) and make a nice profit. 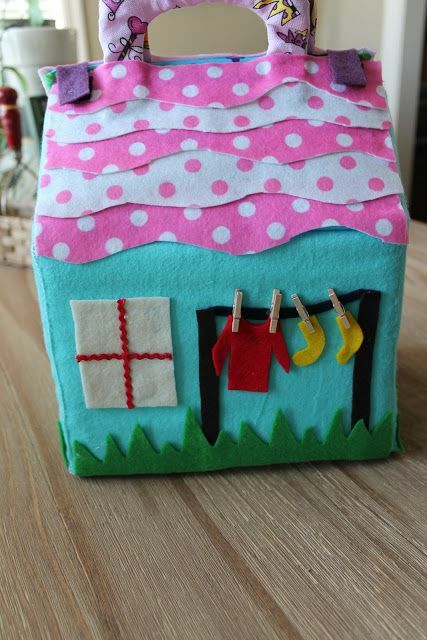 Though the original intention for the tiny felt home was to house the felt dolls from Delilah Iris Design’s line (a for purchase pattern available on her site), I found a variety of uses for it, including as a storage area for tea, business cards or recipe cards, and sewing notions. Of course, if you’d like to house little creatures but don’t want to buy the felt doll pattern, you can also use it as a home for Calico Critters and other 3-4″ toys. 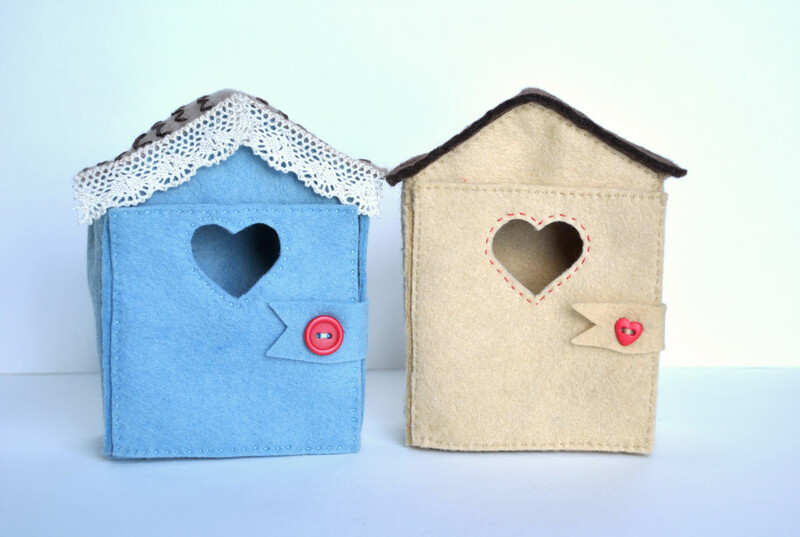 To make your own tiny felt home, you’ll need the following materials: felt (2-3 pieces, which can be different colors if you want or simply one color), scissors, an embroidery needle, embroidery thread, lace, and a button. 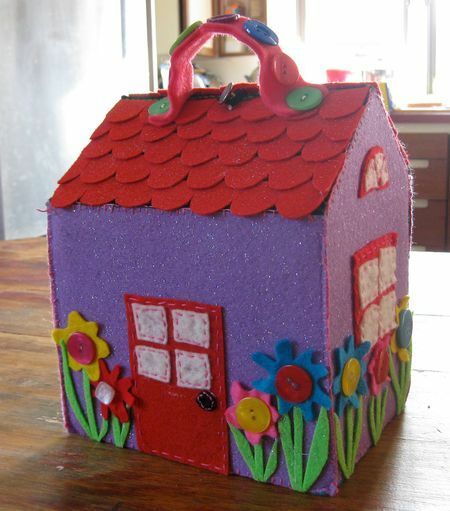 You can also add foam cutouts, ribbon, beads, and Sculpey clay to make your house unique. I used felt in three different colors — one color for the back of the house, the front, and the door, one color for the sides and bottom of the house, and one for the roof. I cut out an oval shape for the window in the door, and added lace above it. I also included a button doorknob with a ribbon loop to keep it closed. 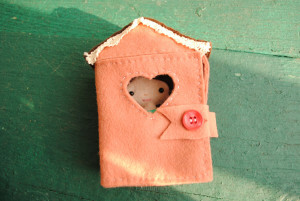 You will need to know the blind stitch, the running stitch, and the blanket stitch to sew the house together. I learned the blanket stitch to do this project, but the other two I was already familiar with. You’ll want to refresh your memory (or get some practice with any new stitches) before beginning because there are some fiddly bits, such as when you are joining the front of the house (the smallest piece) to the sides and the roof. Cutting out the pattern doesn’t take very long at all, but depending on how fast a sewer you are, putting the house together can take anywhere between a few hours to an afternoon. I did cheat a little and sewed some of it using my sewing machine, but I wouldn’t recommend it as the felt can stretch and then the pattern pieces won’t match. Despite the few little mistakes I made during the first house, this has quickly become a new favorite craft of mine. I made a second house yesterday and used netting and ricrac to spruce it up.